Dang I wish I could go to this. Someone up North please attend and tell me all about it! 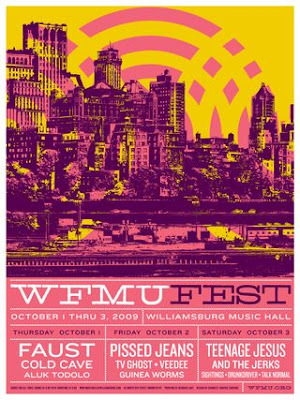 "Breaking news: for three nights October 1st, 2nd, and 3rd WFMU Fest takes over the Music Hall of Williamsburg for our very first ever big-scale multi-day curated concert event. Hot damn. Check out this lineup: Thursday October 1st: Krautrock pioneers Faust, with Cold Cave and Aluk Todolo opening! Friday, October 2nd: a home run punk fest featuring Pissed Jeans, TV Ghost, Vee Dee, and Guinea Worms! Saturday the 3rd features the return of No Wave legends Teenage Jesus and the Jerks plus a triple attack setup of NYC noisemongers Sightings, Drunkdriver, and Talk Normal. Tickets will be available in advance via the Music Hall of Williamsburg's site starting September 3rd. We will not be broadcasting, so you better get on out and not miss this, it's gonna melt brains! More info on the bands after the jump:"